City of Jerusalem | Our Father Abraham | Israel and the Nations | Is Christianity Jewish? Most Jewish people state that they do not believe that Yeshua (Jesus) is the Messiah, because that is the official position that most rabbis have emphatically taught. Having said that, it must be noted that a growing minority of Jewish rabbis and people do believe in Yeshua and that he is the promised Messiah. The real questions and issues are these: "What do the Hebrew Scriptures say about a promised Messiah for Israel?" "What did pre-Rabbinic Judaism teach about the Messiah?" "Can one read the Scriptures for one's self with the guidance of the Holy Spirit, without the interpretation of teachers and preachers?" The key to answering the questions above is to study the prophecies and writings found in all three sections of the Tanakh. "When you seek Me, you will find Me, provided you seek for Me wholeheartedly." (Torah - Deuteronomy 4:29; Nevi'im - Jeremiah 29:13; Ketuvim - Proverbs 8:17). During the twelfth century, Maimonides (Rambam) attempted to counter Christian interpretations of Hebrew Scripture, so he provided an alternative Jewish response for the Jewish people. He wrote, "All the books of the prophets (Nevi'im) and all the Sacred Writings (Ketuvim) will ultimately be annulled in the era of the Moshiach, except for the book of Esther." 2 (Esther is the story of God's deliverance from the schemes of Haman. Purim is to be remembered throughout every generation). Consequently, few Jews today seriously read and study the Nevi'im (prophets) and Ketuvim (writings). Nonetheless, these Scriptures are still considered part and parcel of the Hebrew Bible, and have significant information for us today about the Messiah and his appearance. Ignoring the study of these important Tanakh scriptures results in missing key messianic prophecies concerning Israel, the nations, and the Messiah himself. Since the 1967 recapture of Jerusalem by Israel, thousands of Jewish people have begun to read and study the Tanakh and have discovered God's promises concerning the restoration of Israel. In doing so, they have also discovered prophecies regarding the messiah. For instance: how to recognize him, what he would do, why he would come, where he would appear, and when he would arrive. During the last 2,000 years there have always been Jewish people who have believed that Yeshua is Israel's promised Messiah. But within the last thirty years, since 1967, many thousands of Jews have embraced Yeshua Messiah with eagerness. The phenomena of the Messianic Jewish movement is that it is not man's doing, but God's, and the movement dates back for two millenniums. Today, there are tens of thousands of Messianic believers worldwide with congregations and fellowships emerging in every part of the world, including many in the Land of Israel. Messianic Judaism is a biblically based movement of Jewish and non-Jewish people who have come to accept Yeshua (Jesus) as the promised messiah. Yeshua in Hebrew means Salvation. Messianic Judaism is a renewal of the covenant God made with Israel and Judah, spoken of by Jeremiah the prophet in Jeremiah 31:31-34. "Who has gone up to heaven and come down? Who has cupped the wind in the palms of his hands? Who has wrapped up the waters in his cloak? Who established all the ends of the earth? What is his name, and what is his son's name? Are the claims of Yeshua and his disciples to be believed? Yeshua said this about himself, "for if you really believed Moshe, you would believe me; because it was about me that he wrote." (John 5:46). By this, Yeshua was simply saying, if the writings of Moses and Torah of God are not taken seriously, then how can someone claiming to be the Jewish Messiah be taken seriously. Did Moses Write Down Everything? In recent years, religious legislation was introduced in the Knesset in Israel that, if enacted, would send Messianic Jews to prison and fine them if they use the Hebrew Scriptures to discuss Yeshua the Messiah. Over the centuries rabbis have exercised their authority to interpret the manner in which the traditions of our people are to be observed, traditions which are said to be based upon the Oral Law that was spoken by God to Moses, and passed down from generation to generation. However, Exodus 24:3-7 states this: "Moshe came and told the people everything Adonai had said, including all the rulings. The people answered with one voice: 'We will obey every word Adonai has spoken.' Moshe wrote down all the words of Adonai... Then he took the book of the covenant and read it aloud, so that the people could hear; and they responded, 'Everything that Adonai has spoken, we will do and obey.'" This passage from the Torah states that Moses wrote down ALL the words of Adonai - ALL the instruction of God. If the written Torah and Tanakh are correct, could there be rabbinical interpretations that teach something different, and apart from the Tanakh? Rabbis, being only human, can be wrong. Isaiah 7:14 speaks of an extraordinary birth for the Messiah that will be a sign to the people. Daniel 9:24-25 states that Messiah will be killed before the destruction of the Second Temple and Jerusalem in 70 CE. Isaiah 49:6 declares that the Messiah will come for both Jews and non-Jews. Some Jews believe that a rabbi who died in the 1990's is the promised messiah. And over the centuries there have been many "so called" Jewish messiahs. There are even Jews who do not believe that God exists. Yet, all are still considered to be Jewish by most Jews. But if a Jew believes in Yeshua, then many Jews, including the government of Israel, say those believers in Yeshua are no longer Jews. Do you see the irony of it all - especially given the fact that Yeshua was born in Israel and is Jewish. in God is to deny one's Jewish identity. So what is wrong if a Jewish person expresses a belief in Yeshua ben David of Nazareth as the messiah? Whether one agrees or disagrees with our conclusions about Yeshua, should not every Jew have the right to decide this, and other matters of religion, for himself? If Yeshua is the promised messiah - is it Jewish to ignore him? One of the underlying fears is, that a Jew who accepts Yeshua will stop being Jewish and become something else, namely "Christian." Sadly to say, there are Jews who have accepted Yeshua and dropped their Jewish identity and heritage. They have assimilated away from their Jewish communities and have assumed other cultural identities. 2,000 years ago, Jews who believed in and followed the teachings of Yeshua were considered a Jewish sect within Judaism - namely Nazarenes. This is what one historical source says about this Nazarene Jewish sect: "They make use not only of the New Testament, but they also use in a way the Old Testament of the Jews; for they do not forbid the books of the Law, the Prophets, and the Writings... so that they are approved of by the Jews, from whom the Nazarenes do not differ in anything; and they profess all the dogmas pertaining to the prescriptions of the Law and to the customs of the Jews, except they believe in Christ (the anointed one)." Epiphanius, Panarion 30:18; 39:7, 375-400 C.E. Yeshua never lived apart from his Jewish community nor did he forsake Torah. Yeshua spoke, "Do not think that I have come to abolish the Torah or the Prophets. I have not come to abolish but to complete. Yes indeed! I tell you that until heaven and earth pass away, not so much as a yud (smallest Hebrew letter) or stroke will pass from the Torah - not until everything that must happen has happened. So whoever disobeys the least of these mitzvot (commandments) and teaches others to do so will be called the least in the Kingdom of Heaven. But whoever obeys them and so teaches will be called great in the Kingdom of Heaven." 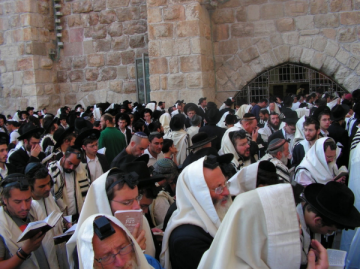 The rabbis taught that to observe the Torah was to complete and fulfill it. To disregard the Torah was to nullify or abolish it. Yeshua was clearly stating his attitude towards the Torah. He never taught that his Jewish followers should ignore Torah. Rather, Yeshua states that those who disregard the commandments of God and teach others to do so will be called least in the Kingdom of Heaven. Not surprisingly, there are many today who fall into this first category described by Yeshua. Likewise, a careful study of Rav Shaul's (Paul) writtings (most of which were written to non-Jews) reveals that he did not teach that Jewish believers in Yeshua should forsake the Torah. Messianic Jews and non-Jews are simply saying this, "Jewish people who believe and accept Yeshua as their Messiah do not need to lose their identity as Jews." Yeshua lived a Jewish lifestyle while honoring God and the Torah. It is very Jewish indeed to accept Yeshua the Messiah and live as a Jew.